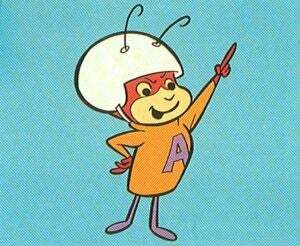 Up and at 'em, Atom Ant! When I was 6, I ate that stuff up! Atom Ant, Secret Squirrel, Super Chicken, Magilla Gorilla, Mighty Mouse, Dudley Doo-Right, Tennessee Tuxedo, Commander McBragg, Go-Go Gophers, UnderDog.....Kiddie Crack, all of 'em! Of course, the copious amounts of sugar disguised as 'part of this nutritious breakfast' didn't help, either. What the cereal makers didn't tell you was, the glass of orange juice was full of protein powder, and the toast with butter was soaked in insulin. But, before I get sidetracked, let's revisit yesterdays Made Up Monday, shall we? First off, no. Otter did not, in fact have meatballs for diner. He reheated a leftover pork chop and cooked up some basmati rice to go with it. As for the bamboo.....all lies. First off, there is no such thing as a forrest full of bamboo trees. Bamboo grows in groves, and it's not a tree. It's a grass. It's closer to your front yard than it is to the tree growing in it. I also lied about the height. Typical bamboo grows to about 30-40 feet high, with some species growing up to 120 feet. So, it's not a tree, doesn't grow in forests, and can grow taller than I said. Although, the bamboo growing 98 inches in one day was true. And now, for todays post. No one likes them. Unless they eat them. And then, they're a tasty treat. A snack, if you will. But, for most people, ants are pests. Giant pests, regardless of their diminutive size. They get in the house, they get in your food, they build mounds all over the yard, some of them bite! Carpenter ants can even be worse than termites, for crying out loud. Yes, ants are a scourge, and we must eliminate them all! But, that would be harder than you think. See, there's this thing called a biomass. If we talk about the biomass of humans, we would have to weigh every single person, and then add up their weights. That number would be the biomass. Hard to come up with an exact number, but easy to estimate. And, if you look at the total biomass of the kingdom Animalia, (of which ants and humans are both a part of. Pretty much everything that's not a plant is part of the kingdom Animalia), you'd be looking at a considerable weight. And of that weight, ants, only ants, make up 10-15% of the total. If you calculate the biomass of just the tropical regions of the world and the ant makes up 25% of the biomass. For a long time, people would tell you that 'termites outnumber humans by 10-1'. That's not true, actually. Ant's however, outnumber humans by orders of magnitude. (termites do outnumber us, But not as much as ants. It's closer to 5-1). I contribute that to the fact that Andrew Zimmern vacationed in the tropics where termites are everywhere. Remember how I mentioned that ants outnumber us? Well, there's ~7 billion humans on the planet. Theres something like 10^8 billion ants. In some South American and African countries, Army Ants are used as surgical sutures. The edges of the skin are drawn together and an ant placed in the middle. It bites down, pulling the edges of skin together. The body is then cut off, leaving the head holding the wound shut.